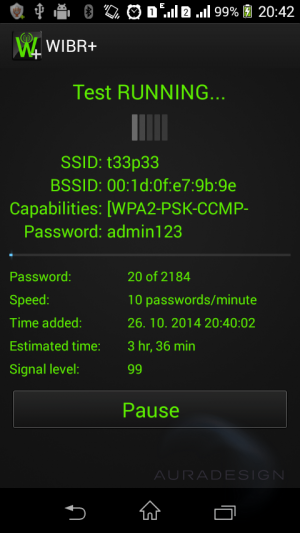 WIBR+ is an advanced application for testing of security of the WPA/WPA2 PSK WiFi networks. This application is NOT FAKE, it really works and it will discover weak password. WIBR+ supports queueing, custom dictionaries, bruteforce generator and advanced monitoring! Dictionary attack – WIBR+ tries passwords from predefined list one by one. Please don’t be disappointed if the password will not be found, it simply means that it was not in the dictionary. However, if the key is set to “12345678” or “password” it will be detected. WIBR+ supports importing of your own password lists, so you are not limited by pre-installed dictionaries! You can download dictionaries here. 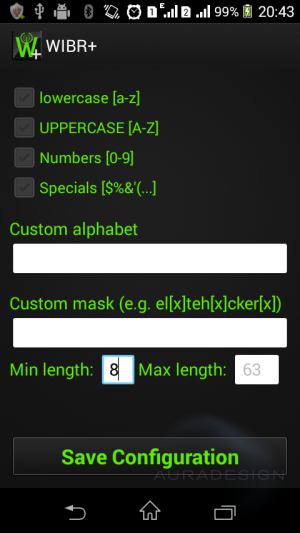 Bruteforce attack – you can select alphabet, length of password and the app will try all combinations of characters in the alphabet. Of course this is complete madness because the number of combinations is growing exponentially with password length. Therefore WIBR+ supports custom alphabet and custom mask. If you know that the password is something like hacker and two digits you can set mask to hacker[x][x] and select the digits alphabet. The app will try all passwords like hacker00, hacker01 through hacker99! 1) List available networks and select desired network. WIBR+ is tested on WPA/WPA2 networks with pre-shared key (PSK). Please note, that the testing will be unreliable if the signal is weak! WARNING: TRYING TO GET ACCESS TO SOMEBODY ELSE’S WIFI WITHOUT PERMISSION MAY BE ILLEGAL! YOU ARE SOLELY RESPONSIBLE FOR WHAT YOU ARE DOING WITH THIS TOOL! 2) Select desired dictionaries or set up the bruteforce test. There are three predefined wordlists which you can use. They contains a list of most commonly used passwords. You can import your own dictionary in txt format, one password per line. Please note that for WPA passwords the minimum length is 8 characters and shorter passwords will be skipped. 3) Wait for results. The process is very slow due to nature of the WiFi connection handling in Android, so be prepared that it can take a loooooooong time. 8 passwords/minute is considered good speed. The wifi have to be enabled all the time, so WIBR+ is also battery eater! Please note that WIBR+ will change password for the selected network. It is impossible to get this password back. If you are testing previously saved network then the password will be lost. – you are trying to access network which is using so called MAC filtering so only explicitly allowed devices could access the network. The solution is to try WIBR+ on another network with good signal.